When I posted a video showing that my mango tree grown from seed had produced fruits in just 2 years, there was lot of reactions from the viewers. They were of the view that it was not possible to get fruits from a mango tree so quickly, and my tree must have been a grafted tree. But it is really true that the mango tree can produce fruits in 2 to 4 years, if they have been grown from a poly-embryonic seed. The mango tree grown from poly-embryonic seed do not need to be grafted. Find a list of polyembryonic mangoes which can grow fruits in 2 to 4 years time. Also learn about mango seed viability and how to store them. Many people think that all seeds contain just one plant embryo. 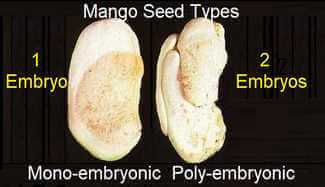 But some mango and citrus seeds are poly-embryonic [1-3]. A polyembryonic seed contains multiple embryos, so produces more than one shoot, actually several shoots depending on the number of embryos. Only one of the shoots originates from fertilization which is not a true clone of the parent seed. All the other seedlings are clones of the mother tree. The fertilized seedling is weak and should be discarded. Although a tree grown from the polyembryonic seed may produce mango fruits in 2 to 4 years time, the tree will produce a good crop when it is around 7 years old. I pinched off all the tiny mango fruits from my 2 year old mango tree so that it could grow. The tree has now grown several branches making it denser. Burma, Cambodia, India (Goa, Karnataka and Coastal parts of Kerala), Laos, Malaysia, Singapore, Thailand and Vietnam. There are many mango varieties which are polyembryonic type. Some of these varieties in Asia and Australia are Kensington Pride or Bowen, R2E2, Bullocks Heart, Bundaberg Late, Kasturi, Champagne, Honey, Altaufo, Manila, Chandrakaran, Cathamia, Baramasia, MA 173, etc. which you can buy from your grocery store. The mangoes grown from the seeds of theses mangoes will be true to type. The suitable varieties of polyembryonic type in USA are Florigon, Laris, Mekong, Ono, Orange, Samini, Simmonds, Torbet. Wester, etc. The Newsletter of Sub-Tropical Fruit Club of Queensland gives a detailed list of polyembryonic type of mangoes in various countries. In India almost all the varieties are monoembryonic. However, some of the Polyembryonic varieties are Gubdu Salem, MA 173, Baramasia, Olor, Chandrakaran, Colombo Black, etc. Following is a list of polyembryonic mangoes in various countries . Bali Apple, Banana-1, Black Java, Bowen (Kensington Pride), Bullocks Heart, Bundaberg, Gullivers Triumph, Ingham Late, Mag-B, Nixon's Special, Peach CG, Roberts-3, Spychala, Tekin, Thomas, TPP 1, Trusso. The north indian mango varieties are all monoembryonic type. The mangoes only form Goa, karnatka and kerla are polyembryonic variety. Binoboy,Cambodiana, Carabao, Corazont, Paho, Pahutan, Pico, Senora and Strawberry. The mango trees grown from the polyembryonic seeds produce their first fruit at 2 – 4 years age, however, the they will produce a reasonably good crop when they are around 7 years old. Both the polyembryonic seed grown mango trees (seedling trees) and grafted trees produce fruits quite early. The mango seedling trees grown from the polyembryonic seeds are relatively resistant to anthracnose problem. Grafted trees grow more slowly than seedling trees. The skin tones of Polyembryonic mangoes are restricted to green, light green and yellow, whereas we see many skin colors of other mangoes. Mangos are not propagated from cuttings or by air layering because such trees have weak roots. So if you are growing a mango tree at your home garden then either you must buy a grafted mango tree or grow it from a polyembryonic seed. The mango seeds lose viability very rapidly. So it must be sown as soon as posible. The mango seed will not germinate if it is more than 3-4 weeks old. The viability of seeds stored even at low temperatures declines. If you cannot sow the mango seeds immediately, you can store them for a few weeks. Place the seeds in a container and cover them with sand and sow them as soon as possible. Seeds stored in sphagnum moss and sealed in a polyethylene bag may germinate over 4 weeks. Storing the mango seeds in 50-percent relative humidity can keep the 80 percent viability even after 60 days. The seeds treated with thiabendazole and packed in a plastic bag at 10-15 deg C can keep the seeds viable for 12 weeks .